Updated the Ore.e Ref. Trans-Horse page. The site is now over 10 years old (earliest Wayback machine save is from 2011)! Added new texts (on top of the old), new photos and new links. Particularly the Trans-Horse link list is convincing… Trans-Horse has produced new works annually for almost five years. I also like that teaching has been a part of the project from the start. 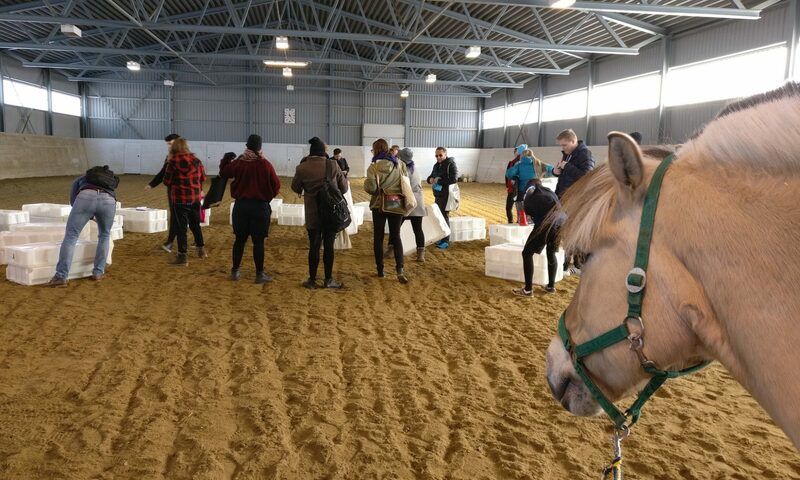 In 2014 we taught friends how to work with horses (from the ground) and we’ve managed to scale these sessions into a full-blown educational program, with lectures, horseface-to-humanface teaching methods and texts. We should write more. I’ve been in contact with IssueX about the possibility to write about the Horse and Performance III course. I wrote a summary of this years course on the Hevoslinja blog (in Finnish). Listening to BRMRF on Soundcloud. Getting prepared for my 6 month New York residency is ISCP (Which is supported by the Alfred Kordelin foundation). Leaving in 42 hours. Packing my synths, prepared computer transportation, prepped my Sebago docksiders and looked up a gym in Brooklyn. I’ll be in NY this Friday and have my first meetings next Monday. I’ll be writing about horses in NY on the Hevoslinja blog (in Finnish) and about general art/city-experiences on this site. On this site I’ll use the tag New York for all residency related texts and Trans-Horse for horse stuff. It might take me a week to get an internet connection working which means that posts might be uploaded in bundles. I was informed that Riveting hammer – Ingersoll Rand – Start 4 (a sound from the SOW collection) is used in an episode of Stories of Yore and Yours podcast (the sound is heard at 16min 15sek). The episode is a reading of a short story called Harrison Bergeron by Kurt Vonnegut (1961). The episode sound effect credit list is a fun read. On the 30th of August, 2006, at Caixaforum ( Barcelona ), Freesound organized a multitudinous (more than 300 people) performance and sound recording called “La audiencia disponible”. This sound is one of those recorded that day. Today is the day! All of the files are available at http://oree.storijapan.net/praxis/sound-of-work/. The complete 1gb .zip file can be downloaded from https://archive.org/details/sow-blacksmith-ed1. Made a video announcing a selection of sound for the Novation Circuit .syx. I got confirmation that the files are ok in freesound (still some tweaking to do). Published a demo on soundcloud. I can now begin to wear the Atlas Copco cap I got from the company as a sponsorship as a token of a successful publication.